Sniper rifles have a maximum of 500fps (using o.2gbb's) with a minimum engagement range of 20 metres. Any player using a sniper rifle must be carrying a back up weapon for contact within your engagement distance. Anyone found breaking the engagement range will loose the right to use a sniper on any of our sites. All equipment will be chrono checked at the start of each game day. The Marshall will ask all players to mag up using the BB's that they intend to shoot during the day. 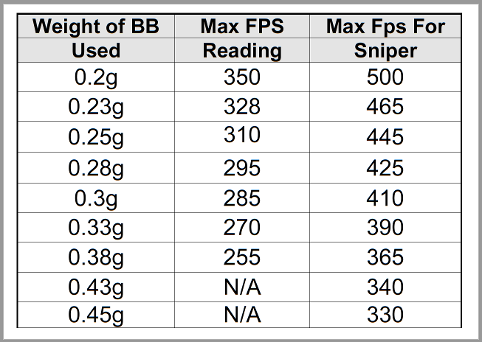 The MAX fps limit for that gun will then adjusted using the chart below. The Marshall will ask you to put three shots through the chrono - with all shots required to registered under the appropriately adjusted FPS limit.